These days are full of a little bit of everything. Primarily dominating our days is school but in between, the garden demands to be released of it's harvest. No matter what you think you have going, the garden may have other plans for you. All the rain we've been getting has been giving us gorgeous sunflowers- an abundance of them, regardless of demand from passersby. The tomatoes are rolling in. So far, I've done one batch of canned (stewed) tomatoes with plans to do more and start sauce this weekend. 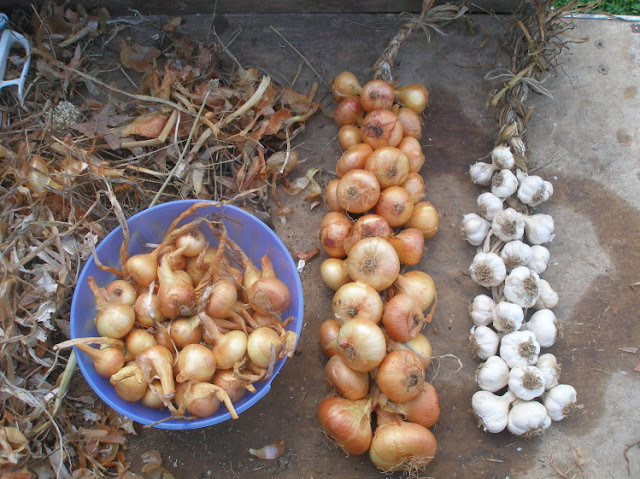 Jamey brought in the onions and garlic awhile ago, but I finally got around to braiding and organizing them. The smaller onions in the bowl will be used in our tomato sauce. But Jamey's going to have to chop them. I don't mind sporting goggles while I chop but if he's willing, I'm going to let him do the job. Here's one of my empty garlic braids. I hate to throw it away. Any ideas of what I can do with it?? Our green bean crop was pretty puny, but that's okay. 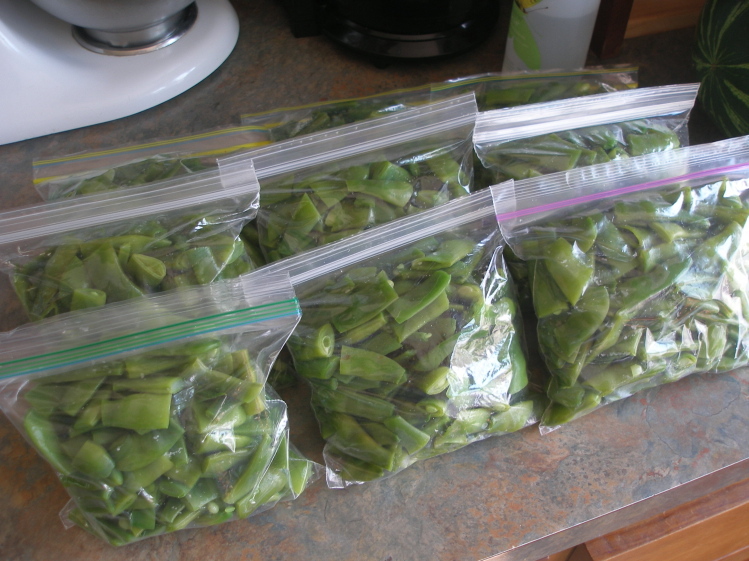 We still have some from last year and our snow pea crop was abundant. I should tattoo this on my forehead: Pick and freeze chard in JULY!! Every year I make the same mistake. I think it's a good idea to wait until the chard gets nice and big to harvest and freeze it but by then the caterpillars, crickets, slugs and all manner of creatures have turned the Swiss chard into Swiss cheese. Here's some of the best I could muster. It's still fine, even with holes, but my goodness. You'd think I'd learn. While Sam and Miriam still love PB&J, this is Sadie's lunch of choice. Talk about a raw foods diet (she does eat the other food groups at other meals). And our watermelon? It's getting a little out of hand. Too bad I don't like the stuff. Good thing everyone else in the house does. That empty garlic braid would be a beautiful base to add some greenery too at Christmas time! You could hang it the way it's hung now with some pine needles and holly! Our green beans went bonkers this year. They've been producing for weeks, but our freezers are long since stuffed. Now they're just going to waste. 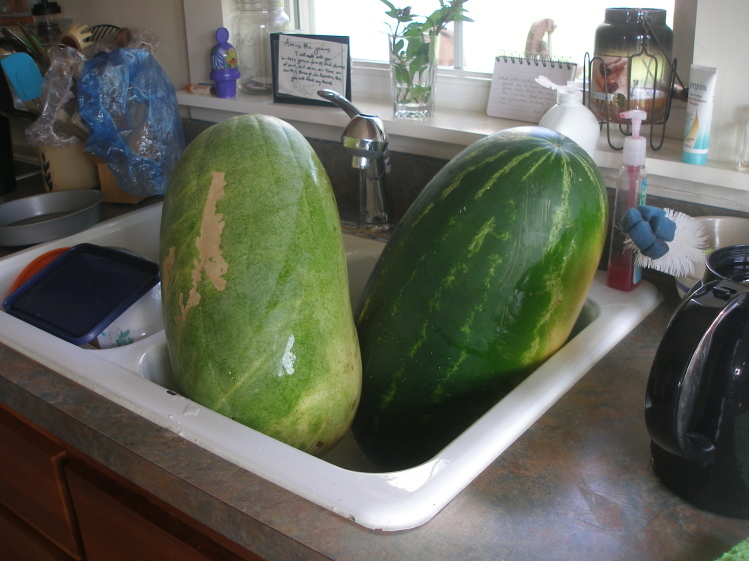 I hear you on the watermelons! 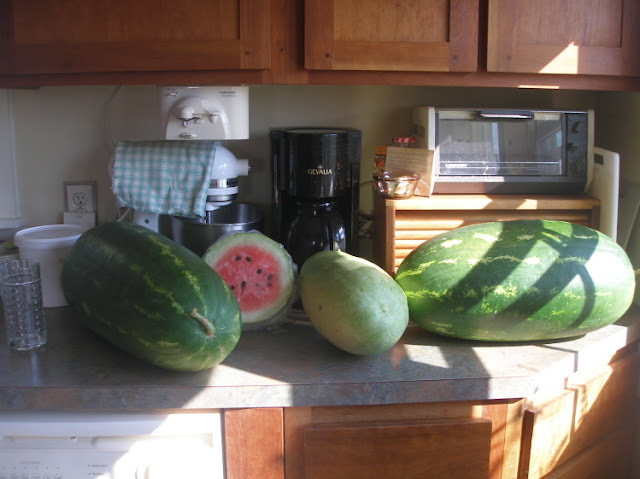 Ours are HUGE and not even all the way ripe yet! We picked a few anyways and they are GOOD! 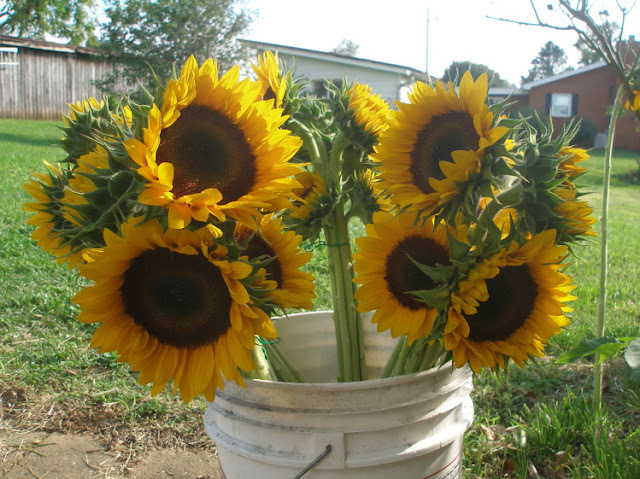 I am wanting to try sunflowers next year. They are so beautiful! Jane - we've become Mennonite. :P Our family is now part of the Midwest Fellowship. 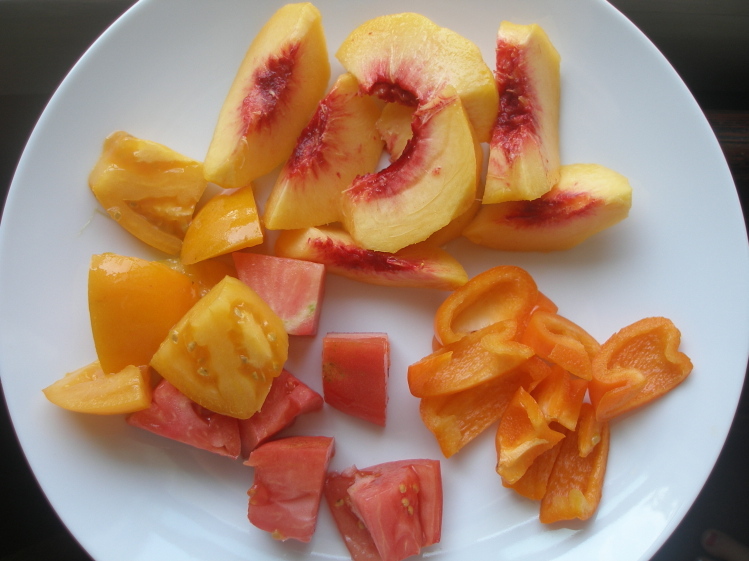 I'm up to my ears in tomatoes and peaches right now. Sadly, my farmer got hit with dry rot and so I'm dealing with "zombie tomatoes", but it's an exercise in how to save what I can from a bad harvest. I'm turning all of it into sauce, because that's what we use. I laughed out loud at all of the watermelon!! We would eat it...my son could eat a whole one by himself in one sitting if I'd let him. He LOVES fruit. I wonder how it would be in a smoothie? 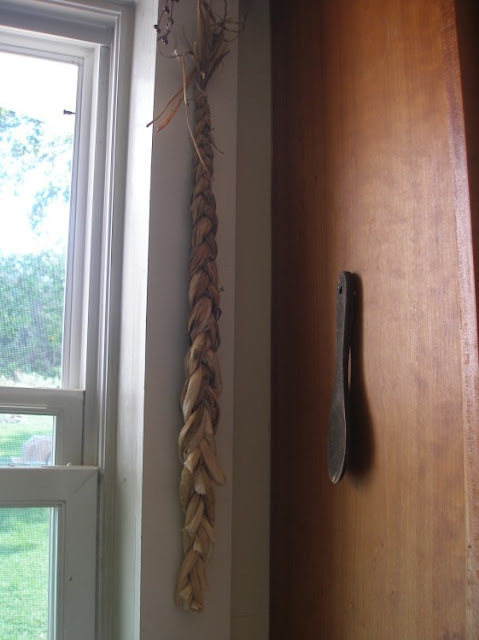 Trying to think of creative uses for garlic braids...the only thing I can come up with is return it to the earth and let it feed next years crop. :/ Not so creative...but definitely useful. I haven't canned one single thing this summer. Not one. And come winter...I will be sad about it. Although our garden wasn't so great this year...I think it might be because Chris put it on auto drip water system. Every other year I've watered by hand...tended...plucked...I think maybe it makes a difference. 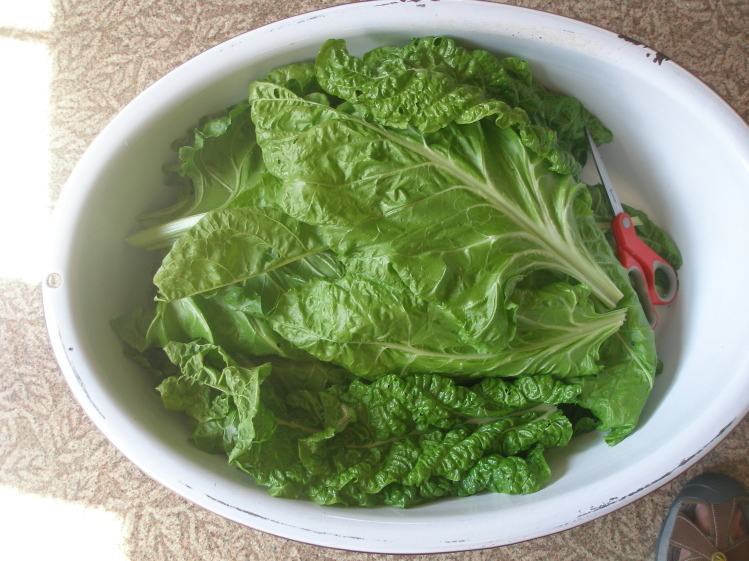 How do you freeze swiss chard? Can you freeze kale, too? Thanks!! I freeze it the same way I freeze spinach. See the preserving page at the top and look under freezing spinach:-). Like I said, I have greatly enjoyed your blog for so many reasons! Thanks! Heather, We just aren't pickle-eaters! Sorry:-). Anyone else want to link to a pickle recipe they love?? I just use the Mrs Wages mix for my pickles. I know its kinda cheating a little but they turn out perfect and its pretty inexpensive at about $3 to make 7 qts. 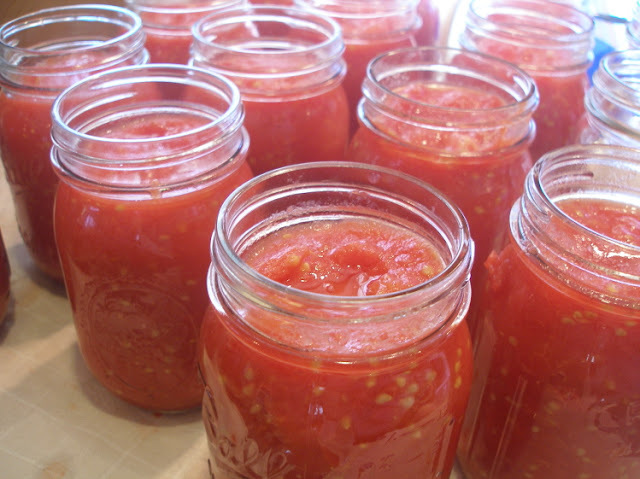 You can find it in most grocery stores in the canning section. LOL...I wondered if maybe that was the case. I LOVE dill pickles, and being pregnant with my 3rd, that 'LOVE' has only increased. I prefer not to use a 'mix' but sometimes, that is the best/most consistent way. I'll have to check if that is available in Canada! I use my old garlic braids to dry herbs for the winter. I just push bunches through and leave them to dry in my pantry. Wondering if garlic braid could be used like a giant straw braid (flat-turned and stitched around itself) to make mats for a mudroom or somewhere similarly scruffy - then just compost when it's sufficiently scruffy. I expect it would take more than one braid, though. I'm so glad to hear I'm not the only lady who prefers to ask her husband to chop raw onions! I am SO vulnerable to crying when chopping raw onions, I very very quickly can't even see through the tears. Plus it hurts. My husband barely tears up when chopping them, so I always ask him to do it. And even then I usually have to leave our small kitchen for a few minutes! re: braid--hot glue dried flowers to it? ?